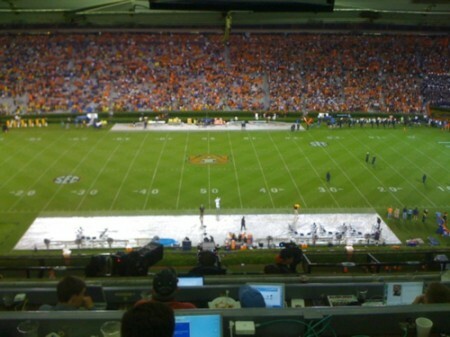 — Auburn beat reporter Andy Bitter, blogging from the Jordan-Hare Stadium press box Saturday, September 19. Paul Conner, 80, wasn’t at the West Virginia game. He doesn’t go any more. It’s hard to walk. And when he goes all he can think about are things like the sewer line and the water pressure in the upper decks. His daughter Nancy went. But she didn’t stay. It’s just that, looking up at the lightning and down on the lake, Nancy (AU ’77, horticulture) actually didn’t think the game was going to happen. She got a signal on her cell phone, called the folks and asked her mom Dixie, like everyone else was trying to ask their mom, what the Weather Channel was saying. The Weather Channel was saying bad things. Possy, Daddy, Paul Conner was sitting there in the recliner with the remote and listening through a hearing aid to the thunder and the puddles grow outside and getting kind of worried. Because it probably wouldn’t be a problem … but dang ESPN cut over to the LSU game during the delay, and when they’d check back they wouldn’t hold a shot on the field long enough for him to be sure. 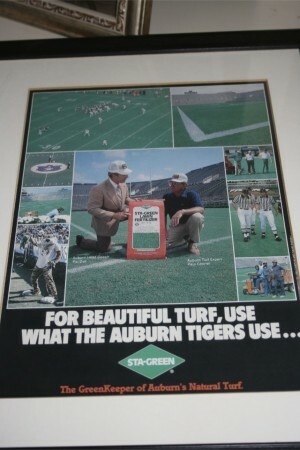 Pat Dye Field — oh, how Paul Conner thinks it deserves that name! 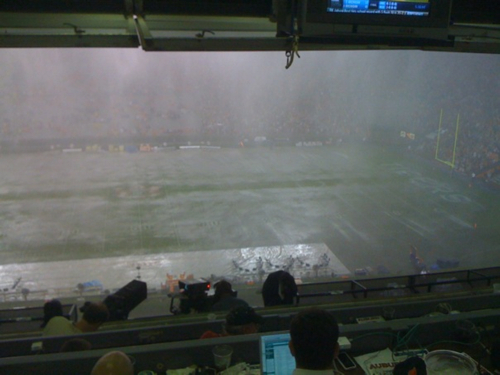 — at Jordan-Hare Stadium could drain 2 inches of rain an hour. At least, that’s how much Conner designed it to drain. Actually, first it was 1983. Paul Conner was in his 19th year in the engineering department and Pat Dye was gearing up for his third and arguably best season as Auburn’s head coach. Maybe Dye knew it was going to be a possible national championship kind of year and he wanted things to look good for television (“And that,” Conner says pointing to the slide of a photo he took of a CBS cameraman on the sidelines, “is why we do it.”). Maybe it was because he knew how special Bo was and he wanted him to have something special to run on (“Hey Daddy,” Nancy asks, “did Bo tear up the field bad when he ran?” Paul looks at her through the glow of the projector. “Are you kidding? That sucker was so fast his feet never touched the grass!”). It’s grade to be an Auburn Tiger: Conner’s crew prepping the new practice fields. Or it could have been that Pat Dye was just sick of playing on Jordan-Hare’s mangy field. And sick of practicing on that mangy field, which he had to practice on because the practice fields were even mangier. 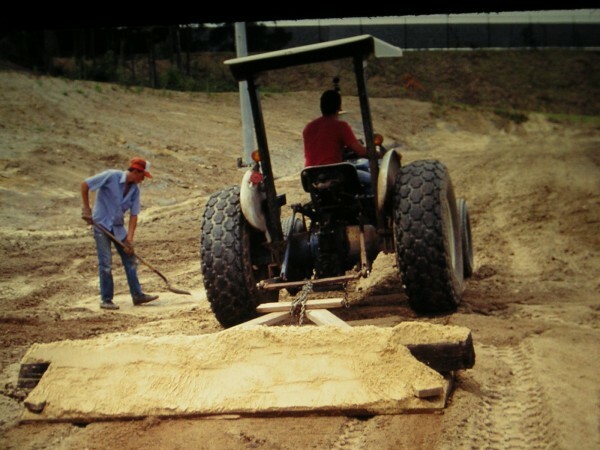 Some good intentioned someone back in the late ’70s had tilled the practice fields with sawdust and sawdust and more sawdust, trying to give it a little structure for the boys. Sawdust is all right for what the old Ag men call a soil amendment, but you’ve got to have your nitrogen and your microbes working like clockwork in order to pull it off and for the water to drain and the only thing clockwork about those old practice fields — “They were made with every kind of grass imaginable,” Conner says, “we called it Heinz 57” — was how they were laid out … how perfectly, undrainably, horribly level they were. Not that Dye really understood water or drainage all that much, either, in any kind of scientific relation to turf beyond knowing that the damn puddles just never disappeared. Because it took till the ’84 season for Possy to convince Coach that what was going to keep his beautiful fields beautiful was a beautiful tear-it-up-again drainage system. But what Dye did immediately understand, what he could sense, was that Paul Conner gave a damn. He gave a damn about things. He gave a damn about his school. 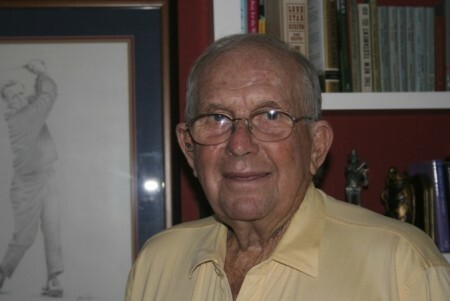 Paul Conner in his study, Sept. 2009. Paul Conner graduated from Auburn with degrees in math and industrial arts in 1957. It was a good year to graduate. He remembers that year’s Iron Bowl (“I’ll never forget ol’ Jackie Burkette interceptin’ a pass and running it diagonally all the way across the field straight at me”) as well as he remembers the ’69 game (“ol’ Connie Frederick ran right by Bear Bryant and shook the ball at him”), as well as he remembers the ’72 shocker (“I was there. … I couldn’t believe it”), as well as he remembers the ’82 contest (“I was up there and Tom Hayley got himself hurt when the goalposts came down and the bloody thing hit him”), the ’84 game (“… it wasn’t so much that Bo went the wrong way, they just called the wrong play”), the ’85 game (“it was disgusting… the play before the field goal, Gene Jelks came through there and we had this little ol’ linebacker and he jumped on Jelk’s back like a monkey on a motorcycle but couldn’t get him down till he got to the sideline”), the ’89 game (“well, that was the most electric thing I’ve ever been a part of”), as well as he remembers all of them. In ’57, he kept warm by wrapping paper sacks around his feet and from the sheer joy of watching the guys he sat next to in class destroy Bama – like they did every year he was in school – and seal the national championship. Those days? Auburn was winning everything. Auburn was on top of the world. In 1981, that was not the case. That more than anything — probably even more than Dixie being the business manager for the Athletic Department — is why Dye and Conner hit it off. Nice grass. Pretty shrubbery. Lots of it. The whole thing. It was May. Texas and the television cameras were coming in September for the first game of the season. September 17. He still remembers the date. Paul Conner knows exactly how he did it. He’s got a whole carousel of photographs he took of how he did it — pristine slides, glazed in that glorious ’80s patina, of guys in tractors razing the dirty, level dirt, probably churning up old Mellow Yellow and Gatorade bottles and chin straps. But Possy still shakes his head. He still defers. When it comes to taking credit, he still points to the picture of the man who but for a few monkeys on motorcycles, a few bad calls, and maybe a 10-point win over Michigan instead of just 2 points wouldn’t just have a great record but an amazing record, the man 10 years his junior who he still calls Coach. Yes, Conner had some incredibly preternatural green thumbs for someone not trained in green thumbing. 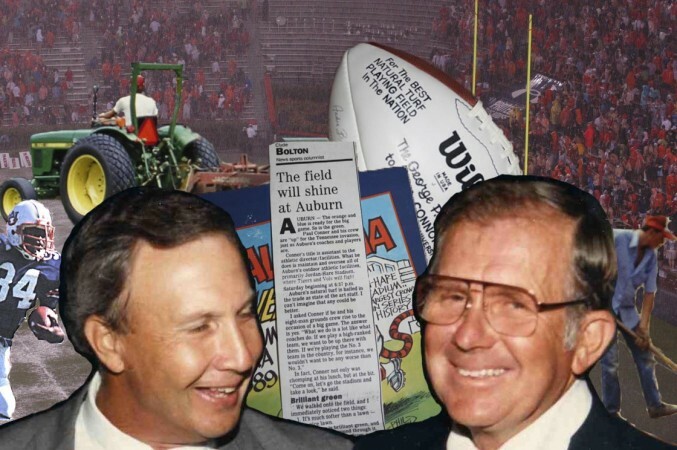 But in those hectic, early, glory days of all that new energy, Dye’s vision for upgrading the “fuhseeluhtez” and treating Auburn like Auburn required not only making the most of available resources but some creative accounting, some end-arounds. And, in all likelihood, a hell of a lot more money. But Conner used some of his own equipment, his own truck. He called in favors for earth moving and sand grading. He paid for his own record-setting not cell phone, not even bag phone but radio phone bill (“I’d call this tower and they’d switch me over so I could communicate with everyone to keep things going”), and says that the next year he even paid for all 17,000 feet of pipe he installed underneath the field to keep the thing dry, the good kind of dry. “I think we figured it up one time that we spent probably less than $100,000 on all the fields,” he says proudly. The 17,000 ft. of flexible piping Conner installed is still in use today. B&G was less than thrilled; Conner kept slicing into the wiring for the time clocks when digging trenches for the irrigation (“I mean, I didn’t know where they were!”) and one day some B&G guy had had it and stormed into Dye’s office demanding he fire Conner. Ha! Conner laughs at the comeback and smiles at the confidence, so typical of his relationship with Dye, which is still strong. 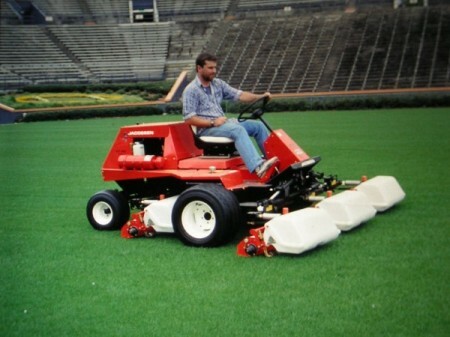 And you know he believes you’re the guy when a year after you’ve created the enviable masterpiece of a field (“We used to play Tennessee every year and when they got ready to do Neyland Stadium, they had the players to vote on what field they wanted it like and they said ‘we want a field as good as Auburn’s,’ Conner says. “That’s in a magazine somewhere”) he lets you talk him into tearing it up again to install not just any drainage system, but one you designed yourself. As green as ever God could have intended. He believed it because in the span of four months the Longhorns may have shown up and handed the Tigers their only loss of the season, but they did so on the Sistine Chapel turned upside down, on grass as green as ever God could have intended, so green you couldn’t see a speck of brown ground under it. He believed it because when Conner got through with the thing, a drop of rain had, at most, 6 inches in any direction before it got sucked into a ditch. He believed it so much that he didn’t just promote Conner to a new position, he created a position to fit around how important he now was: Assistant to the Athletic Director/Facilities. The concession stands. The women’s bathrooms. The glorious field. Maintain the facilities. … develop the facilities. He resigned from the engineering department and maintained and developed the hell out of them until retiring in 1992. You almost get jealous thinking of the sense of ownership in the program he must have; the man literally laid the groundwork for the modern era of Auburn football, carpeting the house that Dye built with exotic blends of Bermuda and rye grass and a rare affinity for work, hard work. Sta-Green ad from the late 80s featuring Dye and Conner. If Possy doesn’t take his crew over there first thing Sunday morning and fill every divot, by hand, with pre-germinated seeds, roll it, water it … maybe Bo’s yards per carry goes down a notch, if such a thing were possible. And apparently damn near indestructible. 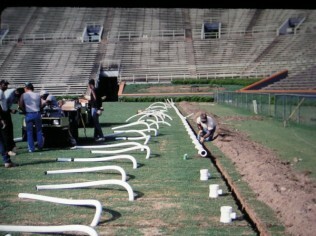 There was the ’86 Georgia game (“Yeah, I remember that — I’m the one who turned on the valve. … We told them not to go on the field.”). But The most stress to Pat Dye Field at Jordan-Hare Stadium prior to September 19, according to Conner, came from the sheer strain of preparation for that first game, The Game, the 1989 Iron Bowl. Let’s just say they rolled out the red carpet of superior Auburn engineering for Alabama’s first visit. Conner climbed all the way to the top of the bleachers in the west corner of the west end zone and took a picture of it, orange and blue shakers exploding everywhere. He clicks to another slide to show me. 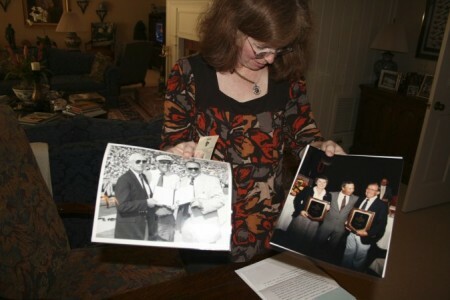 Nancy Teel holds photos of her parents Paul Conner and Dixie Conner receiving distiguised service awards from former Auburn coach Pat Dye, and her father posing with former Auburn University president Dr. William Muse. Jordan-Hare has experienced a lot of torrential downpours in Auburn since 1984, but nothing like the other night, at least before a game, when there’s no time for anything but hope. He sat there with the remote in his hands, waiting. Lee County sagged. Creeks swelled. Dixie told him Nancy was on her way home. He was either going to see those 100 yards taut and supple as ever. Or he was going to see divots and gashes and floating hash marks. Then they showed the field, live … and started raving. Conner leaned back in the recliner and smiled. 3.75 inches an hour, apparently, 3.75 inches an hour. It takes more than 200 hours per month to produce, edit, and maintain The War Eagle Reader. If you like what we do, and you’d like to help us keep doing it, please consider making a small donation or advertising with us. Wonderful story! One of the best I’ve read in a long time. Thanks for it! That design has been tested before, in 1989 if I’m not mistaken. When Georgia Southern University (where my father went to school and where I am current in grad school (’04 undergrad at Auburn)) built their football stadium shortly after the redesign of Jordan Hare, they used the design for drainage at Paulson Stadium. In 1989 they played the Hugo Bowl, a Thursday night ESPN game in the middle of Hurricane Hugo, and the field stayed just as beautiful throughout the entire game as it had ever looked, and looked no worse for wear by the end of the night. I could be completely mistaken about what GSU’s field (then GSC) was based on, but I’ve always been told it was based off of Auburn’s drainage system. If you can find footage of that Hugo Bowl game, you ought to take a look. It dumped rain the ENTIRE day and all through the game, and the field never showed any signs of stress. It was beautiful. That is awesome. I love these type of stories. Keep it up Jeremy. And I second the other two comments on the story. That’s a fantastic story on the history of the field and it’s crowning achievement in the West Virginia game. Good one, amazing how many home-made legends populate Auburn and other campi. Nice insight into Dye’s world also. I had alway heard the legend of Dye’s first day on campus. Supposedly he called the jock dorm and told the team captains to post a set of do’s and dont’s for the dorm. He then said he’d be there in 15 mins to make sure the rules were enforced. Supposedly that set off a fury in the dorm resulting in tons of contraband being flung out the windows to avoid Dye’s wrath. Great Story: Have come to expect great stories from Jeremy. Keep it up and send this story to ESPN. When I suggested this to you as a possible story I never imagined it would come out like this. God has truly gifted you with the ability to bring a story to life! I know Nancy Conner Teel, Paul Conner, and all the Conner family will appreciate the way you weaved the story of Auburn football, Pat Dye Field at Jordan-Hare stadium, and her dad’s contribution, together to form a tapestry of love and dedication for everything Auburn. I know I do! That is terrific stuff. War Eagle Mr. Conner! Paul Conner is my Grandfather. He is the most amazing man I have ever known. This story is a true testament to the wonderful caring man he is. He loves his family and he loves the Auburn Tigers! War Eagle!!!!! What a great story and how wonderful it must have been to sit and talk with Mr. Conner as he shared it with you. I can imagine all the things Auburn he must have in his home and how neat it must have been to see and touch some of them. Thank you. Very interesting and informative story. Awesome man, a great father to his 4 daughters and all the friends they brought into the house! Hello Conner family and a salute to this grand scale achievement for Auburn! Paul Conner is my grandfather. He very is fun to be around because he is always teaching me how to build things. I really like hearing him talk about how he planted the field. in the School of Engineering. discing up the turf getting ready to install a drainage system and new turf. I have told many people that Paul Conner could get grass to grow on a rock. Paul Conner is my definition of a true Auburn MAN. I’ve had the pleasure of working for, and with this man for about 36 years. in fact, I worked with him this afternoon on a little project he’s into. A person could NEVER understand how brilliant this man is from reading this or any article. He has so much knowledge about so many different things. He is a problem solver. A genius. I have learned from him for 36 years. It never gets old hanging with a man that offers so much……Thanks Paul…..for everything!!!!!!!!! I wuz there…one of the worst ‘frog stranglers’ i ever seen. 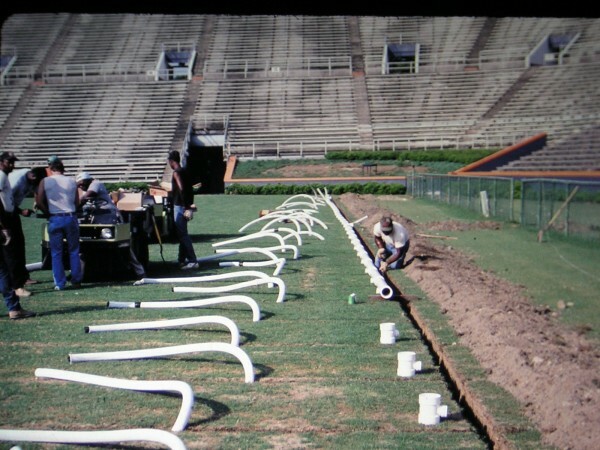 Pat Dye’s field came through great…in contrast to the uat brain-childs that dumped 4 truck loads of coal dust on our football field at Mt. Brook Jr. High (1960 ) in B-ham then tilled it under…About half way during our season the whole thing had turned to clouds of black dust…along with our sinus and lungs. Credit a real uat brain trust…along with the same dimple brains that built the upper deck at fleagion field…which closed the first day it was supposed to open. Here’s mud in yur eye tider…Say! I hear you’ve got a muddy end zone too. See ya in J/H….on a ‘real’ football field! Wargle! I have read this article three times since an abridged version was published in the alum news magazine. Each time I read it, I catch myself saying “wow” over and over. Well done. Thanks — that means a lot. i just read this article in the fall 2010 auburn magazine but remembered one of my friends had sent the link for the original here shortly after it was posted. i enjoyed the magazine article but the original, with all the pictures and fun facts, is by far the best. excellent work. Thanks Kim, that means a lot! A story I wrote on Bo Jackson was published in the current issue of Auburn Magazine, but I’m about to post a more detailed version here. As weird as it may sound, I have a great affinity for lovely patches of Bermuda grass. My wife doesn’t understand, but tolerates it (I own three real mowers for my 1/2 acre lot). This, understandably, is journalism worthy of some sort of prize. Thanks for the up close and personal insight from two great and unique perspectives. I once said the ultimate promotion would be to work on Ed Mangum’s grounds crew at Turner Field. Being an AU grad, I now have a better “dream job”. Paul Connor is the man! Hey! That’s my YouTube video that you have linked in this article. I feel almost famous! Really enjoyed the article. One of the BEST articles I have ever read! I could not quit smiling, both with amusement and with pride! I was right out there in that Tsunami of a rain storm. I never moved from my Section 10 seat….there was nowhere to go, so I sang and cheered as if I was back in Auburn again after being out for nearly 40 years!!!! And I could hardly believe my own eyes when I saw the field had drained as if by magic!! WOW! A thousand WOWS!!! Thank you Mr. Connor for your “gift” to Auburn’s football program AND to us, the Auburn Family!! War Eagle, sir!!! How did I miss that the first time? That’s friggin hilarious.